Q1. 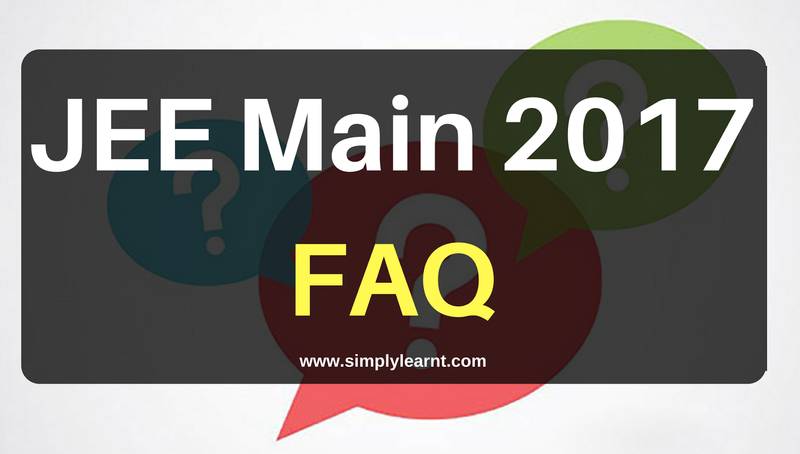 What is the age limit for JEE Main 2017? Answer: Date of birth for JEE Main 2017 is must be on or after october 1, 1992. However age is relaxed by 5 year for SC, ST/PWD candidates. Q2. Marks for qualifying examination? Answer: For the candidates to qualify for the admission in the IITs/NITs/IIITs and such other CFTIs whose admissions are based on the JEE (Advanced)/JEE(Main) ranks, they should have secured at least 75% marks in the 12th class examination, or be in the top 20 percentile in the 12th class examination conducted by the respective Boards. For SC/ST students the qualifying marks would be 65% in the 12th class examination. Q3. What will be the subject combination? Q4: How many times a person can attempt for JEE Main? Answer: The number of attempts, which a candidate can avail at JEE Main exam is limited to three(3). Q5. What should be the year of passing qualifying examination? Q6. How to fill application form? Q7. How much the “Application Fees” for JEE Main 2017? Q. What is the exam pattern for JEE main 2017? Courses: It is held for engineering courses (B.Tech/BE). Number of Questions: It is consisted of 90 MCQ (Multiple Choice Questions). The paper will be asked from subjects as Physics, Chemistry and Mathematics. Mode: It will be commenced via both; online & offline. Negative Marking: 1 mark will be deducted for each incorrect response or multi-responses. Courses: It is held for Architecture course. (B.Arch). Number of Questions: It is consisted of 82 questions (MCQs) out of which 30 questions from mathematics, 50 questions from aptitude test and 2 questions (descriptive) of drawing test. Subjects: The paper will be asked from subjects as Mathematics, Aptitude, Drawing. Mode: It will be commenced via offline mode. Marking Scheme: 4 marks for each correct response (2 questions of drawing will carry 70 marks). Negative Marking: 1 mark will be deducted for each incorrect or multi-responses. Q8. How many times the JEE Main examination held in a year? Q9. 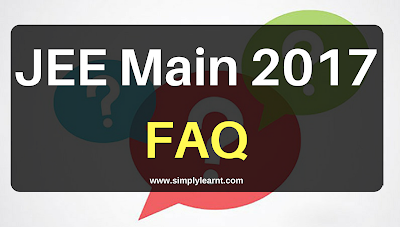 Will board provide the correction facility for JEE Main 2017? Answer: As per the previous years look it may be provided. Better you fill your form correct in one time. Q10. Will 12th marks be added in JEE score to prepare the merit? Answer: No, class 12th marks will not be added in year 2017. Q11. Will diploma holders be eligible for lateral entry through JEE Main exam? Answer: No, JEE Main exam held only for providing the regular (first year-first semester) admission. Q12. Will vicant seat in IITs be filled by JEE main score after counselling & allocation 2017? Answer: No, If seats remain vacant then too not be filled by JEE Main. Q13. Are transgender allowed to appear the JEE Main examination 2017? Q14. Can a candidate owe facility of two types of reservation? Q15. What is the mode of submission of JEE Main application? Q16. What will be the JEE main cut-off? Answer: The cut-off is the minimum score required by the candidates to get admission in the top colleges of the country. The JEE Main 2017 Cut-off will be decided by various factors such as number of students appearing for the exam, difficulty level of exam, etc. Q17: Is there a different criteria or section for NRIs/foreign students for phone number? Ans: NRIs or foreign applicants need to mention their mobile number in the place/field of landline number. Q18: What will be the criteria for thumb impression while filling JEE Main 2017 application form? Ans: Male candidates need to provide their left hand thumb impression, while in case of female applicants, right hand thumb impression is required. In case the applicant uploads incorrect thumb impression, then he/she has to provide the same thumb impression during examination on the attendance sheet. Q19: In case a transaction fails while paying the fee for JEE Main 2017, what needs to be done? Ans: If the payment status of online transaction (by credit/debit card) is not communicated by payment gateway in real time, then fee payment is not completed. In this case, the candidates are required to pay the fees again either through online transaction or by e-challan and to download the acknowledgement page. Your amount of failed transaction of credit/debit card will be refunded back within 7 to 10 days. Q20: Is there any provision for students if they wish to appear for both the exams at different centers i.e Paper -1 (Computer based) and Paper -2 (Pen and Paper based)? Ans: Since Paper-2 is only in offline mode, a student who is appearing for both the papers - paper 1 being online mode and paper 2 being offline mode, will only get such centers that have facility for both the modes of examination. For example: Test centers for this could be PATNA: PEN & PAPER BASED and COMPUTER BASED. Two different roll numbers and separate admit cards cannot be issued to a candidate to appear at different centres for paper 1 and 2 separately. Q21: Is there any option available that the Hindi Medium paper comes in both the languages? Ans: Yes, Hindi medium paper will be bilingual in English and Hindi medium. Q22: What if a candidate has no thumb? Answer: He/ she can upload impression of finger or foot thumb also and same should be applied on the attendance sheet during examination. Q23: Why are there no sample papers for offline exams? Answer: The mock test available on our website for all the candidates who have opted either for pen and paper based mode or computer based mode. However it is also for practice purpose and to give candidates look and feel of the Computer Based Examination (CBE).